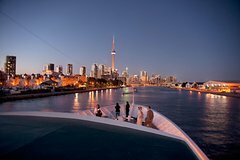 Board your cruise at Queen's Quay Terminal in downtown Toronto at 6:30pm and get ready for a relaxing, scenic 3-hour cruise along Toronto Harbour. From the outdoor viewing decks or the comfortable indoor cabin, enjoy views of the Toronto skyline glowing in the evening light. You'll pass sites including the Toronto Island parkland and waterways, Harbourfront Centre, CN Tower, Rogers Centre, HTO Park, Sugar Beach, the Redpath Sugar Refinery, Air Canada Centre and the fabled Gibraltar Point Lighthouse -- the oldest landmark in Toronto. Catch a stellar sunset, grab drinks from the bar (own expense), and sit down at your reserved seating area for a gourmet buffet dinner freshly prepared by the chef (see Itinerary for sample menu). Then, dance the night away under starry skies with live DJ entertainment! Your memorable Toronto dinner cruise ends around 10:30pm.